An Algerian military plane has crashed near the capital killing 257 people on board, officials say. The aircraft came down just after taking off from Boufarik military airport, west of Algiers. 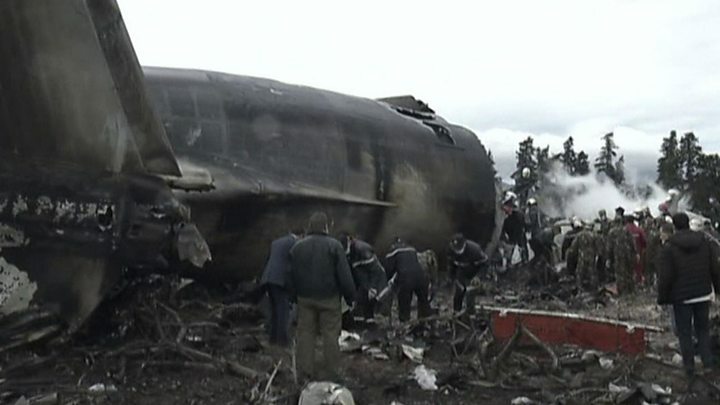 An inquiry is under way into the cause of the crash - Algeria's worst-ever air disaster. The government has declared three days of national mourning. Most of the dead are army personnel and their families, the defence ministry says. Ten crew members also died. Passengers from Western Sahara, a disputed territory annexed by Morocco after Spain withdrew in 1975, were among the fatalities. The Polisario Front, which is seeking independence for the territory and is backed by Algeria, says 30 Western Saharans, including women and children, died. A senior member of Algeria's ruling FLN party said those killed included 26 Polisario members. The plane, an Ilyushin Il-76, was travelling to Bechar and Tindouf in the south-west of the country. The Tindouf region, which borders Western Sahara, is home to refugee camps and serves as a base for the Polisario Front. As one might expect in the immediate aftermath of such incidents, there are more questions than answers over this latest deadly plane crash in Algeria. For now, it is not known whether the cause was due to safety or mechanical problems, pilot error or interference - but these are elements that will likely be examined during the course of the investigation. The country's maintenance record of both military and commercial aircraft will also likely come under close scrutiny in the coming days. But for Algeria, and its military institution, the loss of life is a tragedy on a scale not seen before in its modern aviation history. Witnesses say they saw a wing catch fire as the plane took off. It then went down, avoiding a highway and crashing into a field. A military aviation observer told the BBC that, based on how intact portions of the plane were, they believed the pilot had tried to crash-land. Dozens of firefighters and rescuers worked around the smouldering wreckage. One eyewitness told local television: "We saw bodies burned. It is a real disaster". Officials are quoted as saying some survivors were taken to hospital, but it is unclear how many there were or what their current condition is. Wednesday's plane crash is the deadliest in the world since July 2014, when all 298 people on board Malaysian Airlines flight MH17 died when it was shot down over eastern Ukraine. It is also the second-deadliest plane crash since 2003.